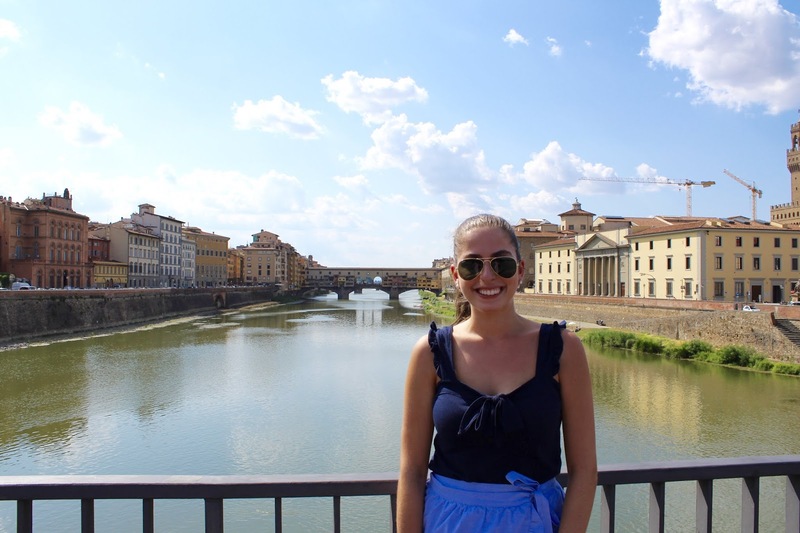 Welcome to my second installment of My Trip to Italy: Florence Travel Guide! Click here to read all about my adventures in Rome! We had another early morning on our fourth day of our trip and it was the first morning the 16 of us were ready on time! We went to the train station in Rome, which is pretty much a small airport and took a high-speed train to Florence! It was such an easy ride, very fast at 300 km/hr and we made it to Florence in an hour and a half through the countryside. Train is really the way to travel in Italy! It was easy, clean and fast! There was limited space for luggage above our seats, but we got on the train fast so the 16 of us had no issues, but the other people in our car had to do some creative maneuvering with their suitcases. 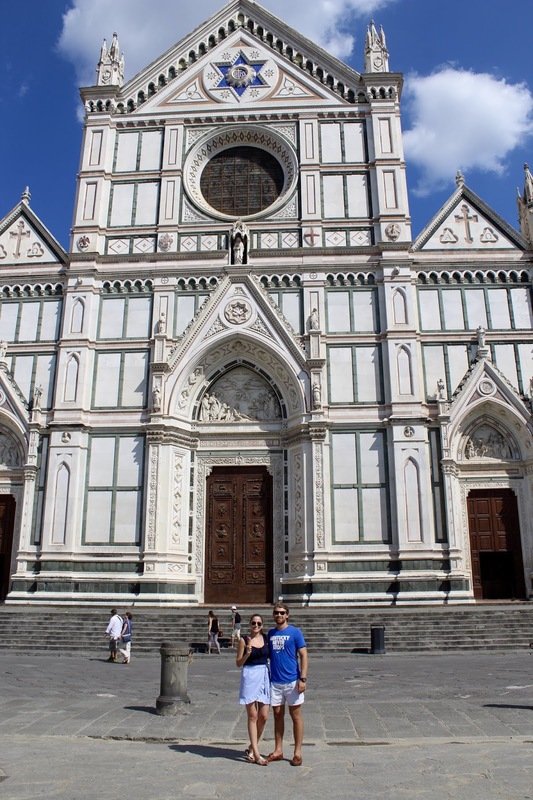 My parents, twin brother and I said arrivederci to the rest of our family, as they went to get their rental cars to drive to Tuscany, as we decided to spend a day and a half in Florence! I am so glad we did! I loved Florence! I thought it was so much cleaner and nicer than Rome. Rome reminded me of NYC and Florence was like Boston. We walked to Finisterrae for lunch, which was very close to our hotel for salads and rosé before continuing to explore our new city. There was amazing gelato in that restaurant and the guy serving the gelato definitely didn’t give me a size small, like I asked! 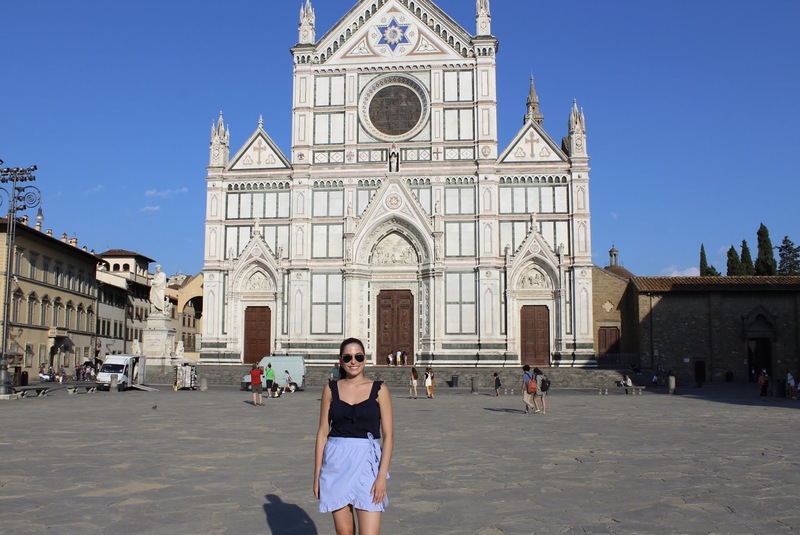 I wore my light blue J Crew cotton wrap skirt (ON SALE) and blue bow tank top, to keep me cool as we explored Florence. We stayed at Hotel Plaza Lucchesi, a gorgeous hotel overlooking the river. The rooms were spacious and very clean! The best part of the hotel was the roof with a pool and gorgeous views of the river and the Domo! My mom and I walked around and saw the famous bridge in Florence, Pointe Vecchio, which has all the gold shops on it. This is the only bridge that was not bombed during World War Two. We did some window shopping and thought about what item we would like to treat ourselves to, to remember our time in Italy. We worked up an appetite and headed to La Giostra for an amazing steak dinner. It was hard to find, but with maps.me, it was pretty easy! You can download the maps before leaving your hotel room in WiFi and then you can have a full working map when you are out walking around a new city without using data or any service. We learned that Florence is best known for its T-bone steak and gold. This restaurant has the most amazing steak! The restaurant was lit by candelabras and was very elegant. Dinner was amazing, and again I was not disappointed! After dinner we had drinks on the roof of our hotel which allowed us to see the whole skyline of Florence! I would definitely recommend going to this hotel for drinks at night even if you do not stay at the hotel! I can’t wait for my two best friends Michelle and Emily to be in Florence in the fall for their semester abroad! They are going to love it! On the 24th, we woke up really early for a walking tour of Florence that started at 8:30 am. We only had a couple of hours in Florence before heading to Tuscany, so we wanted to jam in everything that we could. We went on a Walks of Italy tour which let us see the two main museums in Florence, Galleria Dell’Accademia and Galleria delgi Uffizi. We learned that the city of Florence is the city of Saint John the Baptist, so a lot of artwork has Saint John the Baptist included in the paintings. We got to see the famous David, by Michelangelo, in the Galleria Dell’Accademia which is a breathtakingly 17 feet tall with amazing real-life like details! I wore my J Crew navy blue gingham dress with my J Crew colorful flower studs and my Sperry classic boat shoes. While on our tour we met a girl from India traveling the world by herself! She was so sweet, and it was so cool to meet her. Everyone in Italy was so nice and very cool! On our tour we also passed the Domo, another gorgeous cathedral. The most beautiful church I have ever seen in my entire life. We learned about the extremely wealthy bankers, the Medicis, who lived in the castle like looking building above and owned all of artwork in the Uffizi gallery. We also went into the famous Uffizi museum which has Botticelli’s’ art work, his most famous one being the birth of Venus, or Venus rising out of the sea. You could spend years at the Uffizi because it was so big!! And it had such great views of the river and the Pointe Vecchio. The Uffizi and Accademia museums were great because they limited the amount of people in the museum at a time, so it wasn’t too crowded and hot like the Sistine Chapel was. In Rome and in Florence, all of the tours we did included a guide and a head-set, so we could listen to the guide even in noisy places. Our tour in Florence was great! All the headsets and tours were so geeky, but they were so worth it. We got to see everything we wanted to see, and we learned so much. I used to be very anti-tour for museums or cities but now I am very pro-tour, because the guides were all so smart and it was a great way to see a city in a short amount of time! We walked over the Pointe Vecchio bridge for lunch and then got in our very nice rental car, an Alpha Romeo, which was only really nice for the first hour we had it because we had a minor accident while making a wrong turn in Tuscany. You will have to read my next blog post to read all about our time in Tuscany.